Days before picking first overall at the 2016 NHL Entry Draft, the Toronto Maple Leafs took another step forward in their rebuilding effort, acquiring impending restricted free agent goaltender Frederik Andersen on Monday from the Anaheim Ducks. In return, Toronto sent the No. 30 overall pick this year (acquired from the Pittsburgh Penguins as part of last summer’s Phil Kessel trade), and a second-round selection in 2017 to the Ducks. The Leafs immediately signed Andersen to a five-year contract. TSN Hockey Insider Bob McKenzie reported the new deal is worth an average of $5 million a season over the full term. “Whenever you have the opportunity to acquire a goaltender who has had success in the playoffs, is at the prime age, and really has the reputation on and off the ice that he has, and the players love playing in front of him, I don’t know how you cannot try and acquire a goaltender like this,” Leafs general manager Lou Lamoriello told TSN1050’s OverDrive after the deal was announced. Andersen, 26, was at the end of a two-year, $2.3-million contract with Anaheim and was rumoured to be in play this off-season after splitting starter duties for most of last season with John Gibson. He appeared in 43 games in 2015-16, putting together a 22-9-7 record with a .919 save percentage and 2.30 goals-against average. Gibson got the nod to start the team’s first-round playoff series against the Nashville Predators but after the Ducks fell behind 0-2, Andersen stepped in and went 3-2 with .947 save percentage and 1.41 goals-against average. The Denmark native had a strong 2014-15 season, during which he set a record for fastest goaltender to 26 wins (26-5-0) and tied the league record for fastest to 50 career wins that had originally been set by Montreal's Bill Durnan in 1944. Andersen led Anaheim to the Western Conference final that year, where they fell to the Chicago Blackhawks in Game 7. This is the second time in the last five years Murray has traded for the Leafs’ pick at No. 30. In 2011, Anaheim gave Toronto the No. 22 selection for No. 30 and No. 39. The Leafs took winger Tyler Biggs, who has never played a game in the NHL and was traded to the Penguins in last summer’s Kessel deal. The Ducks selected Rickard Rakell at No. 30 and Gibson at No. 39, two players who have become important pieces in their success. The Maple Leafs hope this time around the trade yields them better dividends, answering a major question about who their No.1 netminder would be going forward. The February trade that sent James Reimer to the San Jose Sharks left three goalies in Toronto’s system, none of whom seem destined to fill the top spot. Veteran Jonathan Bernier was their best option, currently with one year left on a two-year pact worth $4.15 million annually. But he struggled for much of last season, posting a 12-21-3 record last season, with .908 save percentage and 2.88 goals-against average. The addition of Andersen, with the impressive size (6-foot-4, 236 pounds) teams covet in the goalie position and a marked ability to maintain composure at a high level since being drafted by Anaheim in the third round in 2012, was a no-brainer. “You need two goaltenders,” Lamoriello said. “We have tremendous respect for Jonathan, but we have acquired a 6-foot-4 goaltender who has athleticism and right now, we’re extremely comfortable with our goaltending. …Without question, it was certainly a focus, but never at the expense of what the overall plan [for the team] is. But I think we all know how important it is to have, in our opinion, a No. 1 goaltender. We feel when you have that he can help the people grow in front of him, without question. Staying patient as the Leafs’ young prospects develop and managing the desire from inside and outside the organization to be more competitive than they were last season is the balancing act Lamoriello is tasked with. “I don’t think any of our expectations will change [with Andersen’s acquisition],” he said. “We’re in a process and we’ve said all along if we had the opportunity to get better...that’s what we’re going to do. Don’t want anyone to get excited. We just solidified a position that, in our opinion, we feel is extremely important. With one of those major issues seemingly addressed, how the Leafs will approach this week’s draft comes into more focus. They still pick at the top of the second round (No. 31 overall) and a left-handed defenceman could well come off the board for them there to begin addressing another need. While the first-round pick price for Andersen may feel, it ultimately fits the Leafs long-term plans quite well. 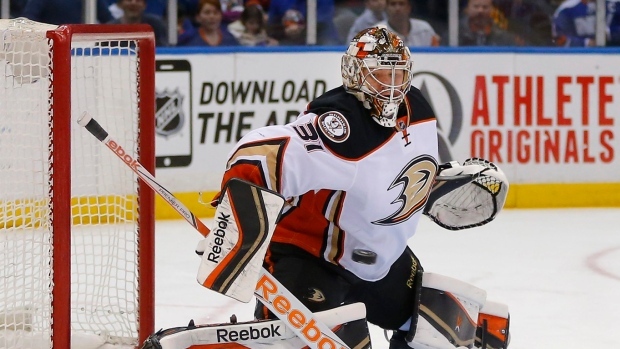 In his mid-20s, Andersen’s best playing years aren’t necessarily even here yet. So the rebuilding process can stay on track while the rest of the Leafs gain confidence from having better players around them.